Appearance: Iren wears a navy blue uniform with a long red cape that reaches from his shoulders to his ankles. His boots reach several inches below the knee. Diagonally from his right shoulder his shirt is decorated by five golden medallions. Iren's hair is long and wavy, stretching past his shoulders. He wears a tri-pointed crown and his eyes are typically narrowed as he seems to be eternally angry. Though middle-aged Iren is still strangely handsome. Weapons: ren bears a staff. It has a twisted shaft, curling toward a blade at the base and a purple jewel surrounded by two wings at the top. The jewel is his planet's life/soul crystal. Iren also carries the wind/water crystal from Jupiter upon his crown. Attacks: Several unspoken attacks as well as "Termination" and "Life Web" which surrounds a person in a web of energy-sucking strings. 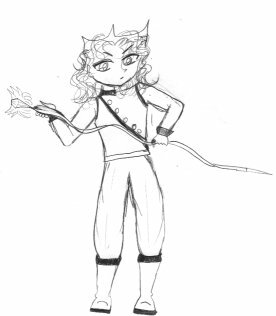 Appearance: Jupisa wears a navy blue uniform that flares into a skirt at her hips. Her legs are covered from toe to upper thigh by black heeled boots. Diagonally from her right shoulder are seven small golden medallions. Jupisa's hair is short and bluntly cut, highlighting her sharp features. Although she possesses a tiara, similar to Iren's, Jupisa only dons it for official governmental functions as it hinders her fighting (at which she excells). She rarely changes expressions and is typically bitchy. At thirty-nine she still appears youthful, though she never has been particularly beautiful. 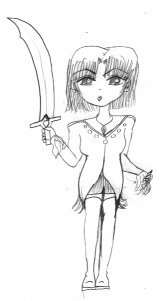 Weapons: Jupisa carries a long, curved sword with which she is amazingly skilled. In its ornate handle is the fire/ice crystal of Jupiter. In her youth she was a champion archeress and a markswoman.